Over the weekend we had a lovely fall family brunch. It was a cool Sunday, but the sun shone through the windows as we sipped Ginger Apple Cider Punch and ate tasty homemade treats. I love gatherings and love the time of year that is ahead. As the entertaining season approaches us, it’s time to think about what hosting supplies you might need, or perhaps you already have a wish list? I noted that we need more serving spoons and a new cake stand would be nice – those are needs, but then there are also wants; like the entire Pottery Barn catalogue. 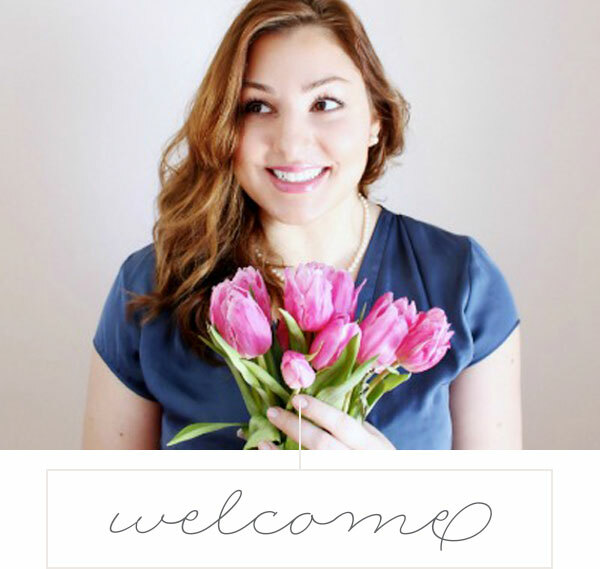 What does your inner hostess have on her list? For our brunch, I set the table with our classic silver-rimmed white dishes and crystal goblet glasses. 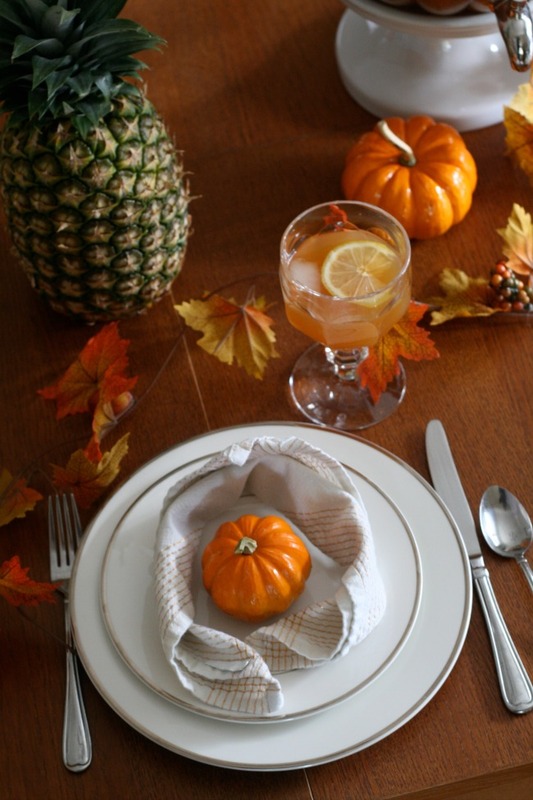 I added a vine of leaves, miniature pumpkins, and two very lush pineapples – I know, not typically fall decor, but I loved how they added height and texture and complimented my gorgeous glass pumpkin drink dispenser from Pottery Barn. My new drink dispenser is going to get a lot of seasonal wear, considering brunches, Canadian Thanksgiving, Halloween, and American Thanksgiving (you bet we celebrate both!!). I love how it sits at just the right height on a pedestal and is easy for guests to refill their drinks at their leisure. Not to mention what a statement piece it is! 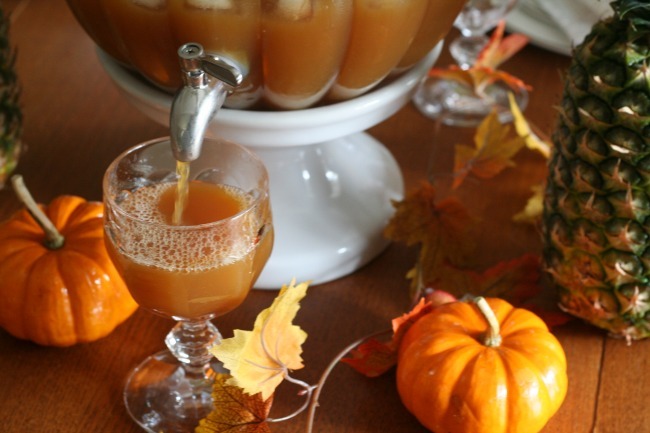 This weekend I tried out my new fall punch recipe, which I will be serving at Thanksgiving as well. This one is non-alcoholic, but you can certainly add personalized shots or spike it with sparkling white wine, depending on your guest list. 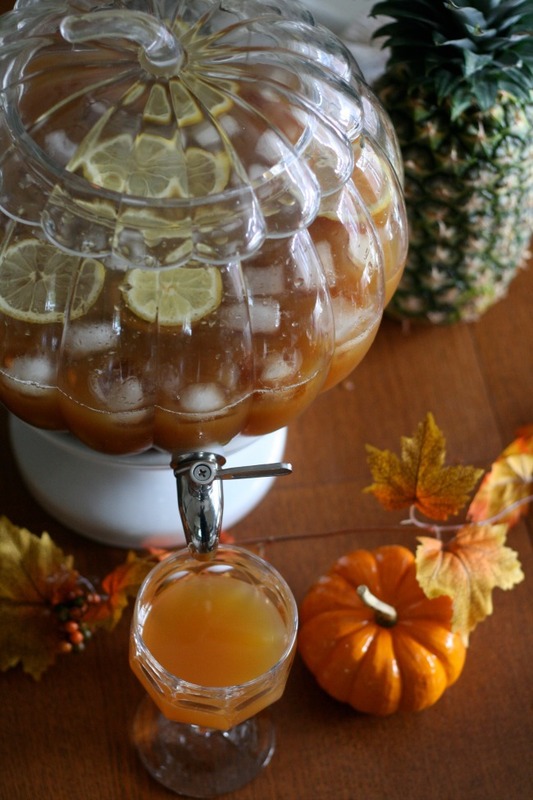 In a large punch bowl, combine apple cider, pineapple juice, and lemon juice. Gently stir. Slowly add in ginger beer. Gently add ice cubes and lemon slices. Serve immediately and enjoy! Makes approximately 12 servings. What do you love about this time of year? I love fires, wool socks, leather boots, pumpkin spice, and walking through the woods. I also love decorating my home for the season – adding rustic elements, more candles, and big comfy throw cushions. 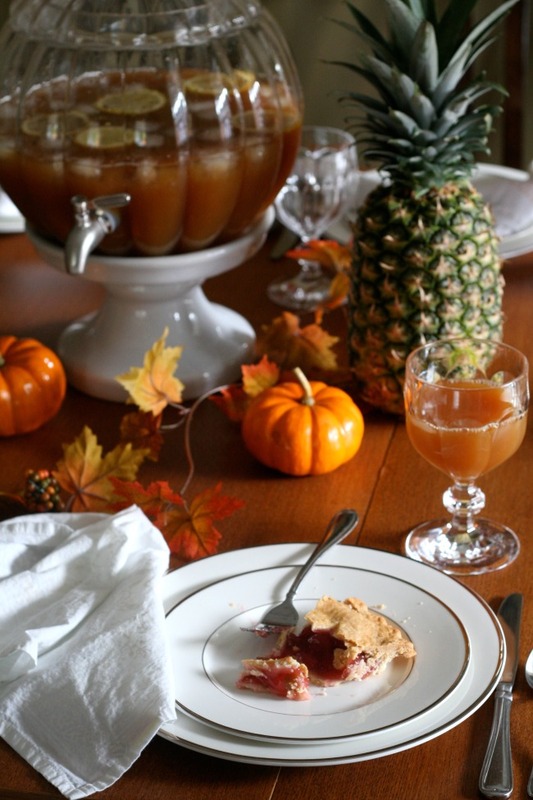 Lovely linens that warm up the table; a unique platter for serving turkey dinner; both wreath and garland from the pinecone & bittersweet collection – they are perfect – and of course, this Fade into Autumn framed print! [line] The Best of this Life received the beautiful drink server from Pottery Barn for photography and article writing purposes. Opinions are my own. Thanks for supporting the fine friends & sponsors of The Best of this Life. I love everything about this punch and the dispenser! Thank you Stephanie, it was delicious! I haven’t tried it that way. To be honest, the root beer might have too strong of a taste and might takeaway the fruity notes of the other ingredients. If you don’t have ginger beer (which is just like a spicy ginger ale), I would use amber ginger ale or regular ginger ale instead. Let me know how it goes! Beautiful photos! Absolutely love the pumpkin drink dispenser. 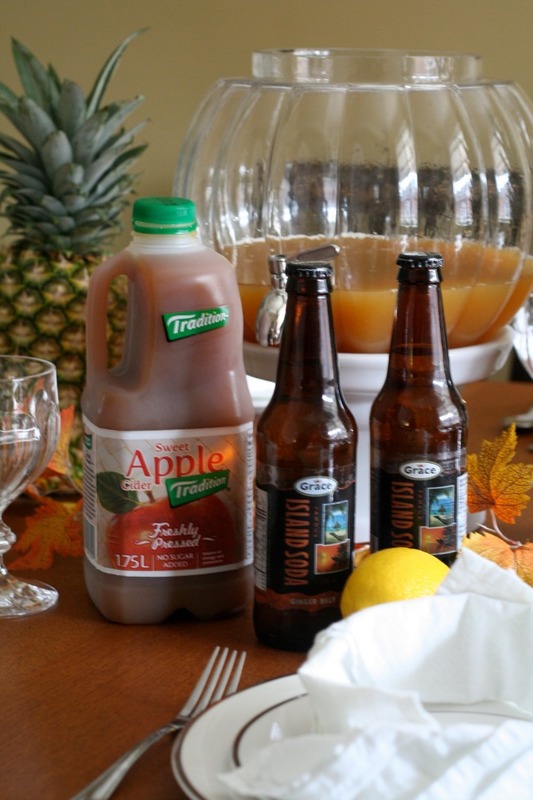 That apple cider punch looks so good! And oh all of the things for parties and decorating I want! They definitely are wants so at my husband and I’s stage of life with a little one and me not working, budget doesn’t allow us to go out and buy those things, BUT my mother in law is amazing and stocks me up every season with decorations, wreaths and candles! She’s wonderful! Beautiful images! I’m in Florida and this blog really makes me want to be curled up with a sweater, a hot drink and fire roaring. Perfect fall post. This is totally awesome! 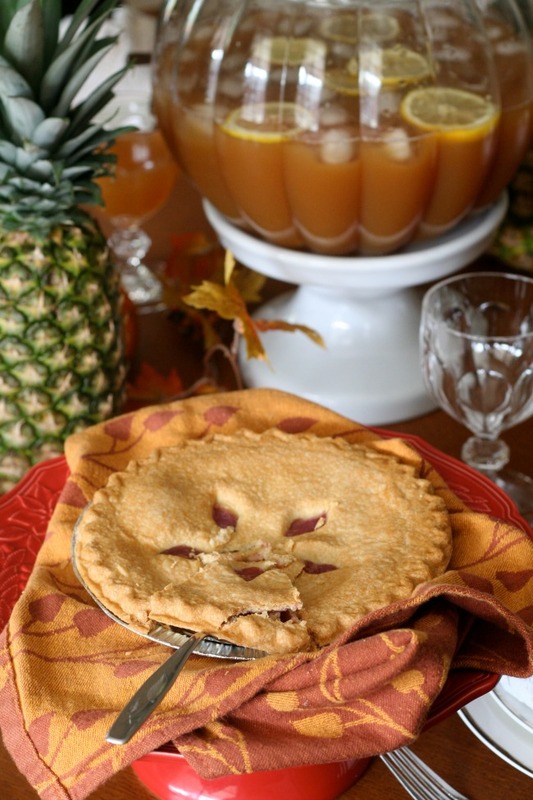 I am so excited for fall recipes! Is it ok that I am wondering how this would taste with bourbon added to the mix? Looks delicious and I love the presentation! This is looks delicious! So trying it! Btw…I’m a fan of Pottery Barn, too! This looks great, I am going to have to try this! This drink sounds delicious, and you did a beautiful job decorating. You’re a great hostess!